Carnival Horizon which is the second Vista-class cruise ship for Carnival Cruise Line has departed for sea trials. The next Carnival cruise ship has departed the Fincantieri shipyard in Italy this morning, October 20th for sea trials. The ship will spend some time at sea testing the propulsion and maneuverability systems to make sure she is ready for regular service in Spring 2018. The Sea trials are major construction milestone and pretty much marks the very final stages of construction which include the interior fitting out phase and final touches. 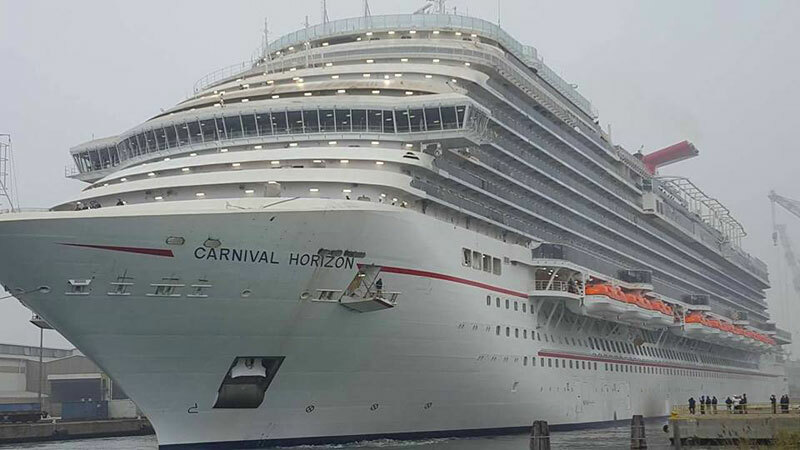 Our friends at I Like Cruise Ships and Carnival Cruise Line Ambassador have posted online Carnival Horizon departing the dock. The popular Carnival Italia page even posted a video of Carnival Horizon departing under a depressing sky, don’t worry the ship will soon be in sunny blue skies once in service next year. It has been a busy day for the upcoming Carnival cruise ship, just earlier we posted a new Virtual Tour from the cruise line which shows the entire ship in a 3D rendering. And recently Carnival has been unveiling new features which will be onboard including the new Guy Fieri Smokehouse Brewhouse and the first Teppanyaki venue in the fleet. Carnival Horizon will be identical to sister ship Carnival Vista but with some new additions. The ship’s maiden voyage will depart Barcelona, Spain on April 2, 2018. After a season based in New York, Carnival Horizon will sail Caribbean cruises year-round from Miami, Florida.